Bulgarian archaeologists have uncovered what they believe is the oldest Christian monastery in Europea near the village of Zlatna Livada in southern Bulgaria. According to latest archaeological research, the St. Athanasius monastery, still functioning near the village, has been founded in 344 by St. Athanasius himself, reports the BGNES agency. Until now, the Candida Casa monastery, founded in 371 AD in Galloway, Scotland, was believed to be the oldest Christian monastery in Europe, followed by the St. Martin monastery in the Pyr?n?es-Orientales, France (373 AD). 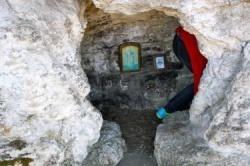 Archaeologists have examined objects in a hermit's cave and shrine located near the present St. Athanasius monastery in Bulgaria, and found evidence that the great saint might have resided there. Additional studies in archives at the Vatican have confirmed that St. Athanasius was present at the Church Council in Serdica (modern Sofia) in 343 AD. He then travelled on to Constantinople and is believed to have stopped in the area of present Zlatna Livada, which is located in Thrace on the ancient way between Serdica and Constantinople. The small village of Zlatna Livada (pop. 123) is located near the Bulgarian town of Chirpan, Stara Zagora region. St. Athanasius of Alexandria (296/8-373) was for a long time Bishop of Alexandria, and is revered as one of the greatest Christian saints. He did extensive work in theology and was one of the key figures in establishing the dogmata of Christian faith that are still accepted by Eastern Orthodox, Catholic and Protestant Christians alike.